I've been having issue obtaining Metronidazole and Praziquantel locally. I was thinking of trying out API General Cure, if manufacturer is to be trusted it contains nothing but Metro and Prazi and is very effective in treating parasitic worms on the fish. I've found a new supplier which im overall happy with except some of their fish come with some form of Monogeneans (if im not mistaken). Fresh water dip usually takes care of it, however its way too much stress for some fish and I'd like to avoid losing fish due to that stress. After reading up on API general cure I've noticed they have wide variety of other medications in their offer, are they any good? If yes which are worth looking into? Other than that I've seen Everything Aquatics advertising similar medication blends, as well as 100% pure active ingredients. This is my second choice, simply because I believe it will be easier to clear API's products on customs. Please advise on what would you use if customs is not something to worry about. Looking forward to your much valued advice. Thank you for swift reply. Our local pharm company charges 350$ for 25 grams. While in the US 500$ 1kg. Just ridiculous. Ps please refer to a pictures of Centropyge heraldi which are in attachment. What could cause that kind of damage? We did fw dip nothing fell off. against ICH. Not any surprise my tiny Regal Tang showed signs of Ich with the tiny Sixbar/Blueface looked grey as it produced more mucus but is now back to normal and I now appear to be in the false time window of no symptoms, but what did surprise me is that a tiny Emperor remained totally blotch/spot free. I think there is more than meets the eye to this and the Emperor did not attract the Whitespot either because it does not "smell" like a fish as it has evolved to be immune, or just by natural evolution but clearly most Emperors get very blotchy with Whitespot, or stress. I think this is a mild strain of Ich and hope the fish build their immune system to combat it on it's own as I have to wait for about ten days before the shipment arrives from the USA. helping remove some swimmers and therefore there are not many fish to propagate the disease only really the tiny "Ich Magnet" Regal Tang. The tiny Blueface/Sixbar is grey again but no signs of spots also the fish are not breathing fast so there are not too many in their gills I hope to have caught the disease in time. I will update once the medication arrives. Thanks again for the your tremendous commitment to the dailies. Even when in Egypt- wow! Just a quick question today. I am making an order from National Fish Pharmacy for Quinine Sulfate and Methylene Blue and wanted to know if you recommend any other medications to have on hand. I've learned that speed is essential in curing diseases and that fish lives can be saved by having the proper meds at home. On a quick side note, according to Drs. Foster and Smith, the Kordon Methylene Blue product states that is to be used for freshwater fish. I know that you've stated countless times that this can also be used for marine. Is there another Methylene Blue product that you recommend for marine? Thank you so much and have a quick safe trip home! Pimafix and protein skimming Hi everyone. Hope you are doing well. <And you> I have a question that has to do with my clownfish. I have a ocellaris clown that is eating well and active. He is showing signs of fin rot on his dorsal and I would like to introduce Pimafix to the system. 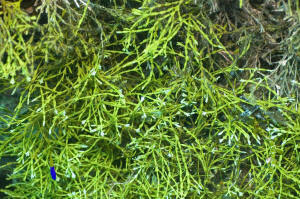 Have had very good results with this in my freshwater system. On the Pimafix bottle it states that the protein skimmer may have to be turned off during treatment. Why is that? Does protein skimming interfere with the effectiveness of Pimafix or does it induce extreme foaming of the skimmer? <The latter. Skimming removes this "remedy" quickly. Bob Fenner> Thank you very much for your time. D.B. The recipe for hydrogen peroxide dips that I was given years ago is 7 ml of peroxide per one litre of aquarium water for 11-13 minutes. I'd be very leery of using the clove oil, since it's been suggested that it has uses for euthanasia, and instead suggest simply placing a lid over the treatment container. Using Fungicides and Antibiotics Together (10/31/04) Hello. A general question on antibiotics/fungicides. If a fish has what looks like fungus on top of a swollen or reddish looking tissue, should it be treated with BOTH a fungicide (Methylene blue maybe?) <Not really useful as a fungicide, at least, not in SW, which is my area. You need a real fungicide labeled as such.> AND an antibiotic? <Fungal infections are often secondarily infected with bacteria due to the tissue damage they do, so treating together would be wise if there is damage like you describe.> As for antibiotics, by reading your FAQs I see that there are many you recommend: Nitrofuranaces, Maracyn, Kanaplex, etc. - are any of them ok to use? I realize that by the time I feel I might want to treat with 2 medications, it is far along for the fish. Do I immediately treat for fungus whenever I see it, and then hope the underlying cause of the fungus will take care of itself? (of course keeping watch on water parameters). Or do I actively treat for both bacteria and fungus? <If there is an open, raw-looking wound, then bacterial infection is probable.> Lastly, can you recommend a book that deals with freshwater disease and includes LOTS of pictures, so I can read up and thus not panic when it actually occurs? <Hope this helps.> Formalin with Sensitive Fishes Hello WetWeb crew person who takes this question : ) <Hello! Ryan with your question today> I've made it a habit to peruse this most awesome website almost everyday as new challenges arise in my marine animal keeping odyssey. Thank you all for your much needed knowledge, time and caring for our piscine critters and their sometimes bewildered owners. <Sometimes? Just joshing> I am seeking advise on treating a pretty sensitive flasher wrasse (not sure if P. carpenteri or p. filamentosus) for a rather persistent case of crypt.. He is in a 15 gallon bare bottomed, PVC pipe quarantine tank along with 5 Stonogobiops gobies. PH has remained at 8.0. I tried a fresh-water dip on the wrasse with adjusted ph to 8.0 and temp around 78f, and the wrasse went stiff and flared, lost color and dropped to the bottom and lay there within 5 seconds. He didn't move when I scooped him out and put him back in the quarantine where he spent twenty four hours breathing heavy and lying in a corner before he recovered. In fact, I believe I was more out stressed by how he reacted. Am not inclined to do that again. Formalin & Orangespot Filefish <Hi, MikeD here> I have a few questions about a couple of subject matters. The first concerns formalin.<OK> I live in California and can no longer find formalin for sale. I have heard two things. The first is that it is illegal to sell here, and the other is that the pharmaceutical company that makes it is no longer in business. What is the truth behind it? I depend on this medication to get rid of the various external parasites found on marine angels and Butterflyfish before introducing them to my aquarium. It is part of the reason I'm able to keep the Eight Banded Butterflyfish (Chaetodon octofasciatus) alive and eating well for a long time now.<I seriously doubt it's the formalin enabling you to keep the fish alive, but rather your husbandry and feeding regimens instead.> How do I get a hold of it, or are there other safe alternatives to ridding fish of their parasites? 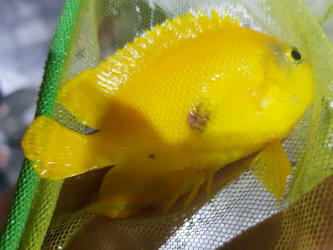 Formalin & Orangespot filefish (continued) <Hi, Mike D again> Thank you for the info. It was very informative. Although I may seem paranoid about parasite infestations, I assure you from the stores I get some of my fish there definitely is a reason to. Many of the pygmy angels and a good 98% of the Butterflyfish I've ever purchased in any store down here come up with some sort of clear parasitic crustacean that feeds on the host fish. The only exception to this rule is usually when I purchase them from excellent and well noted mail order stores from out of state. What exactly the creature is eating, whether blood or tissue is not clear. But when they go undetected for some time, (a matter of a few days), the damage they do to their hosts becomes very evident. Trust me, they're extremely difficult to detect to a novice aquarist.<It sounds like it. I live in Florida and catch my own aquarium fish on a regular basis, so this is not a common parasite.> I didn't know about this until someone working at a pet store showed them to me. Weird lesions and raised bumps begin to appear. Then the fish seem to mysteriously die. I have treated against these little monstrosities using freshwater baths, but they're too stressful for the fish, hence asking about formalin. Ich treatment: Is Ruby Reef Hydroplex safe (5/29/04) Is Ruby Reef Hydroplex safe to use on a Porcupine Puffer? < I am not familiar with that medication/treatment ....sorry. I did do a bit of research for you and came up with no helpful information. The contents are not listed and there is no mention of contraindications for certain fish species. I would suggest either contacting the manufacturer or instead using one of the other known ich remedies like a pH & temp adjusted fresh water dip for 7 to 8 min and up to 30 if the fish is comfortable and tolerating the dip. Any signs of distress the fish needs to be removed immediately. Never leave the fish un attended. In addition hyposalinity, lowering the main tank to a specific gravity of 1.010 for 4 to 6 weeks. Some believe that lacing food with garlic preparations is helpful. Its effectiveness is controversial but certainly is not harmful.> He has ich and needs some medicated fresh water dips. How often and for how long should I do this? < there is information on freshwater dips and hyposalinity here http://reefkeeping.com/issues/2003-08/sp/index.htm http://www.petsforum.com/personal/trevor-jones/hyposalinity.html http://www.wetwebmedia.com/ichart2mar.htm ..... He is living in the main tank by himself right now. My clown is in a hospital tank with CopperSafe. Is this okay for the clown? <Never mix medications unless the manufacturer instructions tell you differently. I did a 50% water change to my 80 gallon main tank. Malachite Green For Ich (4/29/04) Hi again ! <Steve Allen with you tonight.> Sorry if I'm bombarding you with lots of questions, but your crew and this site is the only one I trust for marine related questions. <Thanks for the vote of confidence.> Would like to ask if Malachite Green is really effective against Ich, and if it is at what stage does it kill the ich (is it in the free-swimming stage, reproduction stage at the substrate, or when attached to the host)? <I would not rely on this medication alone. Also, it can be dangerous if not used very carefully. Read here: http://reefkeeping.com/issues/skip/sp/feature/index.htm and search the term on WWM for details. The reefkeeping.com reference is part 2 of an excellent 5-part series on ich.> I have 2 false Percs, and 1 black saddleback in my QT. The saddleback is new and replaced my Sebae which perished in the Ich war. The Percs are better, their on the 2nd week going to 3rd, no trace of Ich, but I may be wrong. I've treated them with 1 week malachite green at 1.017 sg <Hyposalinity only works at much lower SG (1.010 range)>, and daily siphoning, and it seemed to work (no obvious grains on the fish, same with the saddleback), and they're now at the recovering and RnR stage. After a week of no symptoms I placed a small clay flowerpot <I prefer PVC fitting--more inert.> and I saw the 3 of them sleeping inside, which is good, and weird, to avoid them sleeping at the QT bottom and get reinfected. <Any ich on the bottom will find its way onto the fish even if they don't sleep at the bottom.> I'm waiting for the 6 weeks fallow period for the main tank, which is why I'm looking at stocking of corals. I'm afraid of putting the fish in the main tank after 6 weeks. Though there are no longer obvious symptoms, I wouldn't want to start all over again. Receiver #2 (10/26/03) Hi Ananda, <Hi!> I went by my LFS guy and got the ingredients for Receiver #2 and they are as follows: Polymers, salts, Nitrofurazone, Methylene blue & sulfas: Diazine, Methazine & Merazine That is what was listed on the canister of ChemAqua Receiver 2. I hope this helps. :) <Yup, and thanks. Given the mix of medications already in this stuff, I wouldn't use anything else with it (except Melafix, perhaps).> Chompers is doing great still and he waves a fin at you and a toothy grin your way!